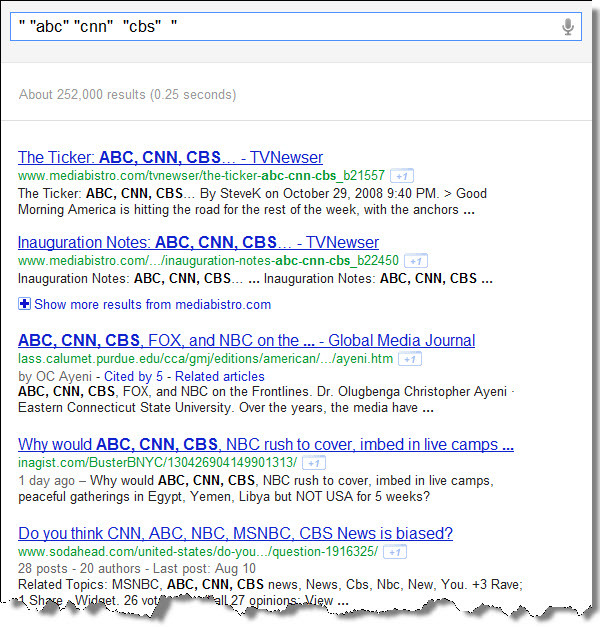 SearchReSearch: The + operator is gone... So what? > Unfortunately, many people believed that a search like [apples +macintosh] would require the term to be in the search results. That's NOT what it did. While the + term would usually be in the results, it was only there because you'd put it into the query! It seems like many people want it - is there a way to require terms in a Google search? @Dan -- Excellent - thanks! 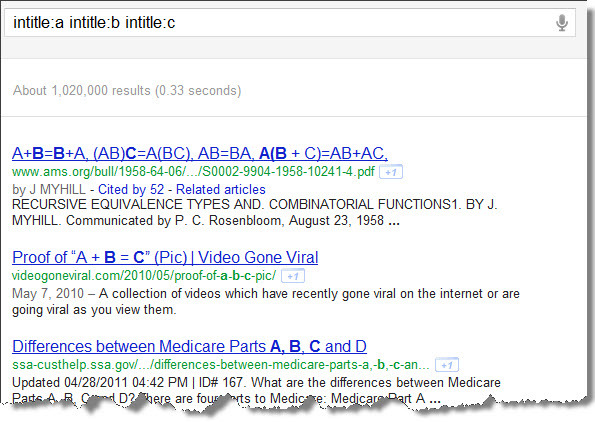 I believe that people are going to interpret your example [ intitle:a intitle:b intitle:c ] as searching for those letters when they are a part of a word, rather than just the word a, the word b, the word c (i.e, that this search would pick up titles that contain abc). So far as I know, that's not how it works -- I think you need to change your example. Yeah, you're kinda missing the point. Firstly, Google - as per usual - changes well understood and widely used syntax, without a single mention. That's fairly indicative of their attitude towards search and searchers. Worthy of comment I'd have thought. Secondly, it makes life more difficult when you're running a meta search across a number of different search engines. Third, it IS another character and for those of us who use it a lot, it IS a bigger deal than you're making it. Fourth, one should be asking *why* they're doing it, and wondering how it's going to be coming back in the future. Thanks for the update Daniel! Definitely makes sense. and seems like a better tool. Have to admit, I have used dbl quotes around a single word in the past hoping for the effect you describe. A shame that Phil, above, is mad at you for sharing these bits of wisdom. I can see that in the long run, Google is looking for the most intuitive search tools possible and slowly phasing out tools that users struggle with. It is frustrating that Google shares so little about changes but I, and I'm sure many like me, appreciate your efforts to clarify and promote the good ones. I hate that you now have to apply by force a whole array of syntax in order to beat Google's fuzzy search correction. You're moving too far in the wrong direction, and this is just another small step. I remember when the + operator wasn't actually required. New From Google for Web Searchers: “Search Using Your Terms, Verbatim” A couple of weeks ago we removed the “+” operator, encouraging the use of the double quotes, which are more likely to be used correctly. 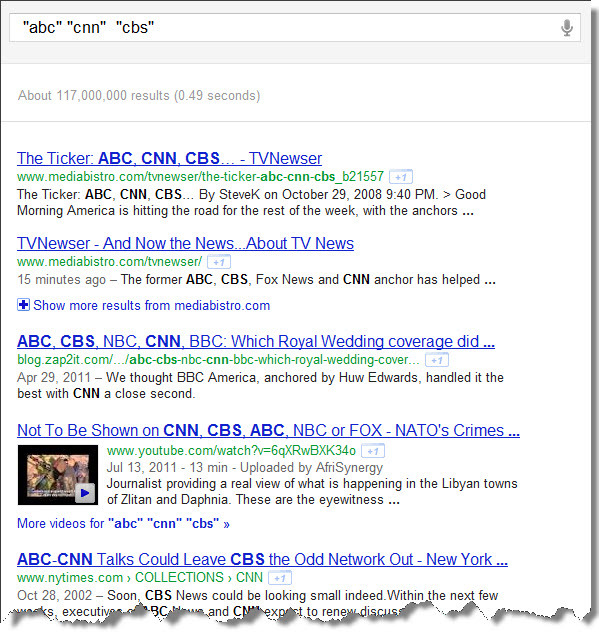 Since then, we’ve received a lot of requests for a more deliberate way to tell Google to search using your exact terms. We’ve been listening, and starting today you’ll be able to do just that through verbatim search.